Whose story is this anyway? I’m constantly surprised at how many scripts I read where it isn’t completely clear. Or the protagonist is clear, but the story is overcrowded with other characters who all seem to have the same weight and occupy the same space. The clearer you are about your character hierarchy, the easier it will be to make it clear to readers. 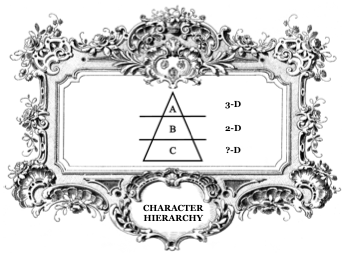 The “A” level character is the Protagonist. The main character who has the greatest need, learns the biggest lesson, takes the most heroic action(s), whose perspective and point of view dominate the story, whose name could be in the title, who is featured in the most scenes and/ or probably the one with whom you most identify. The Protagonist is the character who will be played by the A-list star in the movie version of your project and is usually the character who has the biggest “arc” (changes the most). He/ she is (hopefully) three-dimensional unless you’re writing “hard genre”. … if they are as important to the story as the Protagonist. Then they warrant a fully developed character arc – and (hopefully) three dimensions of their own. It’s important to be clear about each “B” level character’s relationship to the Protagonist. What function do they perform in the main character’s life and in the story – and how does it change (if it does)? Every “B” level character should also have a story arc, although not as detailed as the Protagonist’s story. Many books and scripts suffer from too many (or doubled) “B” level characters that sprawl into “C” level characters. “C” level characters are everyone else in the project, no matter how much fun they are or how much you love them. They have to move the plot, add significant comedy or tragedy or why are they here taking our attention away from the beloved “A” and “B” level people? “C” level characters usually have only one dimension and rarely have a character arc. 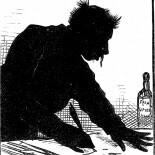 They don’t change – or aren’t given enough page-time to illustrate any change. I guess you could consider some minor characters “D” level, but do us all a favor and never name a character “THUG”, or even worse, “THUG #1”. If they aren’t important enough to have a name, consider cutting them out. This entry was posted on October 2, 2015 by gregorymilleris in Creative Process and tagged Characters, Process.